The Blue Force Gear Ten-Speed M4 Mag Pouch w/Helium Whisper Attachment System offers legendary performance with the perfect blend of speed and security. Now with the revolutionary single piece Helium Whisper Attachment System. How much is a few ounces lighter worth? How much is a half a second worth? How much is health worth? Invaluable when it counts. We sometimes overlook the compounding impact of this value. Despite all the extensive studies and tests through history of the load carriage evolution, the material and design of the packs and pouches on the simplest level is relatively unchanged. With the Patent Pending Helium Whisper Attachment System, Blue Force Gear is further refining and simplifying the modular pouch on the basic level. Helium Whisper is a revolutionary design aspect - combining a single piece back panel with an ultra-light, extremely durable high performance laminate - drastically reducing the number of parts currently used on MOLLE attachment backing. 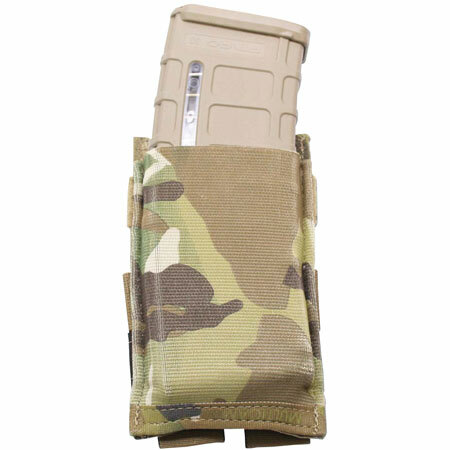 The Natick Snap system, the most common MOLLE attachment backing found on issue pouches, consists of 27 parts at roughly 84 grams or 3 ounces. Helium Whisper reduces just the backing down to 6 parts at almost half the weight of roughly 44 grams. The design of stiffened straps is also inherently weak as the straps that hold the pouch on to a vest are separate pieces sewn on the pouch backing. It's not common practice to drag a downed buddy or carry gear by the pouch but sometimes, it may be all that is available. The integrity of the pouch and possibly life itself is being held to the vest or pack is only as strong as the thread and inch of stitching. With Helium Whisper, the attachment straps are integral to the pouch and not sewn on, eliminating the possibility of stitching failure. The metal snaps on the traditional pouches can break or bend - a damage that is not easily repaired in the field. Metal is also hot, cold, sharp and hard. Metal parts on gear or equipment pose a secondary fragmentation threat to the wearer or bystanders. With the Helium Whisper backing snaps are replaced by tucked under hook-and-loop, a tried and true method brought on by the Ten-Speed line. The world is full of discomforts and hazards and risks standing in the way of the protectors of good in carrying out their mission. Hardly can we control them all, but we owe it the ones that protect our freedom in providing even the smallest increase in safety, speed and comfort. A few ounces here, a few seconds there can be the result of a disabling injury from a load and finishing the mission or a quick mag change neutralizing a threat or a hung up mag that turns the tides of war. Those that need it the most; deserve the best - and Helium Whisper is next evolution of gear that Blue Force Gear offers to ensure success and freedom for us all.